“When I was planning my wedding, I paid a lot of attention to the rituals. I’ve always enjoyed any excuse to commemorate a special occasion with some kind of ritual or celebration—birthdays, public holidays, you name it. So, for an occasion as special as my own wedding, I wanted to get the rituals absolutely right. It was also important to me to give our wedding guests the opportunity to understand what each part of the wedding meant. After all, they were going to be witnesses to the rituals, and I felt intuitively that they would draw more meaning from their experience if they understood the symbolism behind what they were seeing. So, with that in mind, I wrote and printed out a little explanatory booklet before my (Jewish) wedding, explaining what each part of the wedding service meant. As I wrote the booklet, I learned a lot about the history of various wedding rituals and traditions and I began to think about them more deeply. Really, rituals are the beating heart of a wedding. When you’re standing with your partner about to place a ring on their finger, or holding a knife together ready to cut the wedding cake, or emerging from your venue holding hands, newly married, there’s a kinetic sense of something important happening. There’s feeling, on a visceral level. My whole life, I will never forget those moments during my own wedding day. By preparing, getting dressed up, taking a day off work, showing up and standing up, by giving of your presence, you connect to those closest to you and you give your best self. You take appropriate pause to acknowledge the distinction between this day and all the others. In ritual you add a layer to your life, allowing others to bear witness. The milestone moments are given the weight they deserve and in these moments, you are transformed somehow. I know this is true; it happened to me. When my husband and I exchanged our wedding rings, we both had tears in our eyes. That moment was something palpable to us and to our witnesses, too. Modern weddings, whether secular or religious, typically involve a ritual of some sort where the two who are marrying look in each other’s eyes for a sustained period of time, often holding hands. This usually happens during the ring exchange or the vows; in many cultures, a veil is lifted from the face right before or after, literally enabling the “seeing.” The act of fullyseeing the other person by looking in their eyes for a long while, without being distracted by periphery happenings, is a ritual that many marriage therapists tell couples to try at home; it builds presence, safety, security, and trust. Teamwork in marriage begins right there with the cutting of the cake: it’s the first practical task you do together after the marriage ceremony. I remember fondly how my husband and I sliced into our many layered, very difficult to cut cake, with some success, and then laughed and kissed right after, celebrating a job well done. In some parts of Germany, the couple has to work in tandem to clean up piles of broken porcelain dishes that their guests throw on the ground to ward off evil spirits. Known as polterabend, this takes place the night before the wedding and is somewhat similar to the cake cutting: the couple has to engage in a practical task together to show they can work collaboratively with an end goal in sight. Some wedding rituals are decidedly romantic. In our culture, marriage isn’t just a practical arrangement. Rather, modern weddings commemorate and celebrate romantic love. The ubiquitous first dance is a ritual that elevates romance, intimacy, and whimsy. For my wedding, the first dance song was the old Frank Sinatra song, “Once in Love with Amy,” and I still smile at the memory of being turned, twirled, and dipped to such doting lyrics. Of course, the closeness and synchronicity shared between two people as they slow dance together is something to aspire to keep throughout marriage—we should all be so lucky to be able to continue to dip, twirl, spin, and slow dance with our beloved throughout our lives. In the Philippines, couples often release a cage of white doves together. Doves court and then mate for life, and this ritual symbolizes the romantic love that the couple hope to achieve in their marriage. This and the first dance remind us of the beauty and peace that can be found in romantic love. Another wedding ritual is that of spending time alone with just your partner. I got married in the Orthodox Jewish tradition, where the bride and groom are locked in a room together and given eight minutes together, alone. The notion of being locked in a room together may sound archaic, but the meaning behind the ritual is as valid as ever: even on the most busy and hectic of days, the two partners in marriage should prioritize taking time to be with just each other. It was such a special eight minutes to be alone with my new husband away from guests and photographers and videographers, right after our wedding ceremony, giggling with each other while we could hear everyone outside the door. In Indonesia, newly married couples have been, historically, forbidden to leave their new marital home for three days after getting married—a ritual that continues in some parts of the country today. A much less extreme, modern take on these old fashioned rituals could be that you plan time to be with your beloved without anyone else around on your wedding day—some couples take a walk, sneak in some private time in their hotel room or sit at their own table for the wedding meal, separated from the wedding guests. Couples have been traditionally showered in rice as they took their first steps out of the wedding venue for… forever. This was a dramatic way of their guests blessing them with wishes for a prosperous, fertile future: historically rice was easy to come by and affordable, which meant it was an easy symbol for fertile fields and fertile wombs. In Guatemala even today, a white ceramic bell filled with rice and flour is broken at weddings. In the States we tend to throw confetti. Being showered in colored paper is a kind of modern blessing for a future filled with growth–if not children, then perhaps ideas, or perhaps the growth of each other and the growth of the partnership between you. When my husband and I stood under a doorway as our guests threw the confetti, there was so much of it that I found some in my shoe and on my husband’s collar later that day. We were a riot of color; we considered ourselves blessed with the creative spirit. This ritual is a good reminder that even when you’re dressed up, you can always get a little bit messy and you can laugh together as you celebrate your growth. It’s also a good time to think about all those who are supporting you and wishing you success. I love the pictures of us covered in confetti; there was so much of it that I think some even ended up in my mouth. 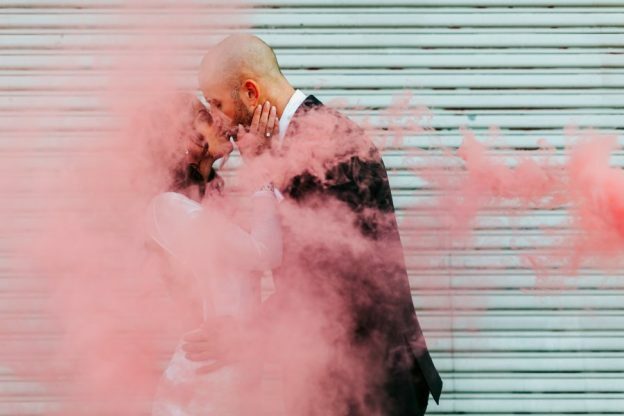 It can be challenging, when you’re in the day in, day out of marriage, to live out the meanings of wedding day rituals: to dance together, cut a cake together, spend quality time, make sustained eye contact, laugh together, show up, be present. But, trying as it can be sometimes, I think it’s fun to try to make wedding day rituals the rituals of our married lives. In marriage—as in life—show up, be present, give of yourself, laugh, hope, and remember how loved and supported you are. Amy Schreibman Walter’s articles and essays have been published widely. On the topic of weddings, her work appears on Smashing the Glass and The Huffington Post. Amy’s book of poems, Houdini’s Wife and Other Women, is available from Dancing Girl Press. Follow Amy on Twitter @amyswalter or find her at www.amyschreibmanwalter.com.